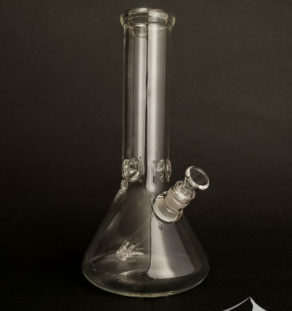 We’re excited to add top quality production pieces by Subliminal Glass to our gallery! Subliminal is known for high end glass sculpted pieces, and they’ve started a high quality production glass line. 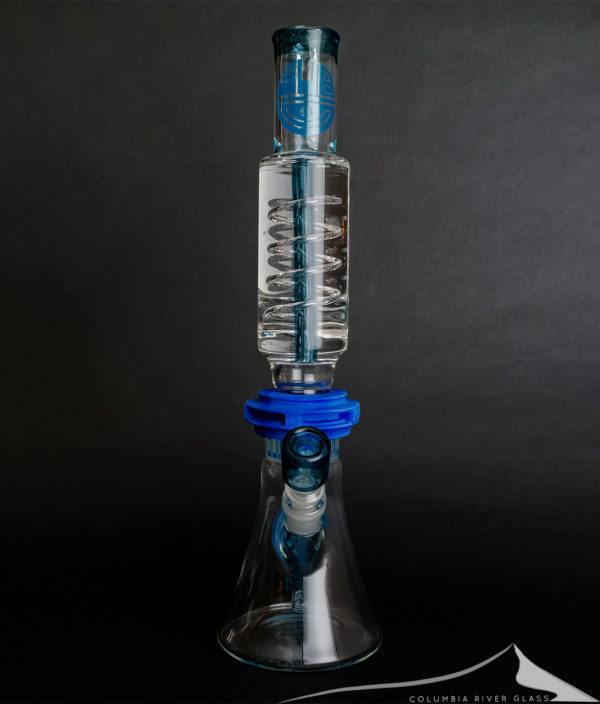 Every detail about these pieces is all about about quality: they use Simax glass for their tubing, considered the best boro rods by one of the oldest borosilicate glass makers. 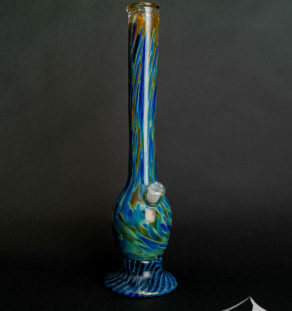 American colors are used in their bongs, like Blue Stardust in this case which looks fantastic. The joints are a little beefier on these pieces, the lines are so clean, attention to detail everywhere. The gridded Blue Stardust downstem really functions with stacking bubbles, it’s high function. 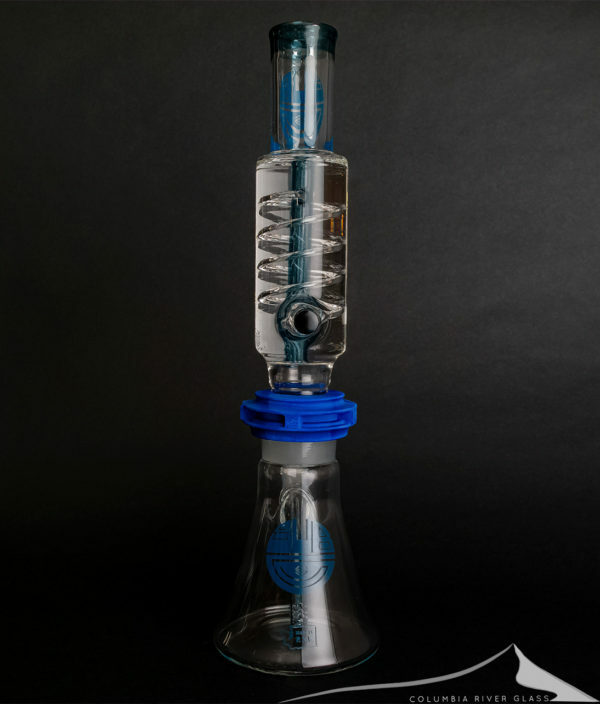 But the star of this piece is the coil condenser glycerin coil top – you place this in the freezer and it cools down to literally freezing, then you can cool down your draw to ice cold without the hassle of ice, or dumping water to keep levels right, etc. The main stem parts into a second smaller coil for enhanced cooling of the draw, and the coil will remain cold for hours. 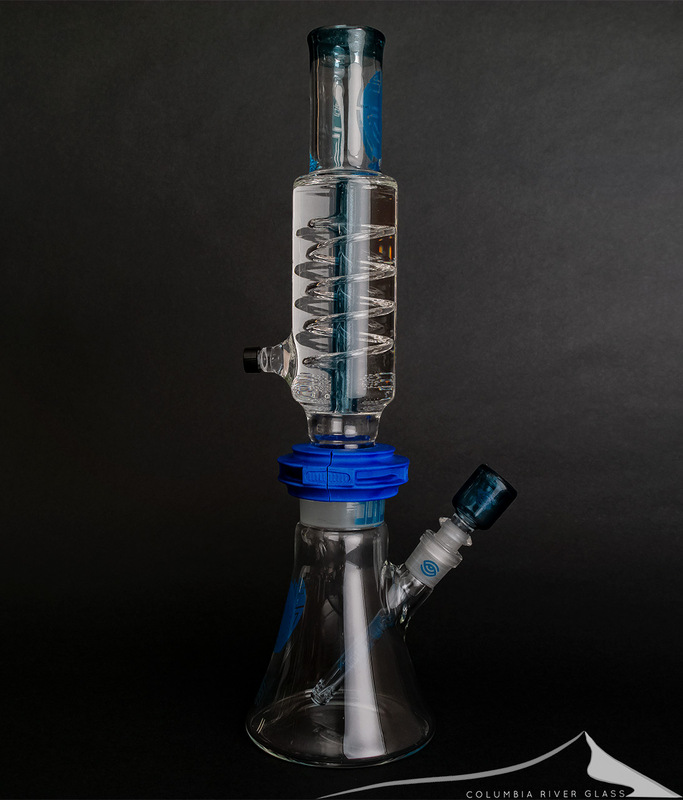 Patrick makes these by putting the glycerin in a vacuum, which makes it more tolerant to temp changes for cleaning or use – so it’s important you do not remove the cap sealing your glycerin coil! The main stem inside the coil is also Blue Stardust, and the branch coil is clear. Subliminal custom 3D prints their joint clips for their pieces in matching colors, and they are held together by rare-Earth magnets. It adds a little confidence when handling the piece. The 14mm custom Blue Stardust flower bowl is included. At 18 inches this is the small coil bong, but it’s still a large size at 18 inches in height. Made in the PNW, here in WA state.